Amanda Frenz is the founder of a new eco-couture company called Error Guided Designs, which provides a unique personalised ethical fashion service. It was my pleasure to interview Amanda and explore the ethical dimensions of this one-of-a-kind label! Q. What drove you to create Error Guided Designs? I have always had a struggle between my passion (fashion design) and being ethical and eco-friendly. The struggle came from the fact that in order to “succeed” or break into and be recognized in fashion, you either have to be well connected or design for mass production, which for the most part is not ethical or environmental friendly. To me it seemed as though I would either have to do a lot of unethical, environmentally harmful jobs before I maybe had the chance to break-free and do something different, or I would have to have a lot of money and connections. The more I tried to get into and work in the fashion industry the more I began to feel that all that mattered to anyone in this field was “the bottom line”. Everything else – even when speaking with “ethical/eco-conscious” people – seemed to fall into second place and become an after thought. Personally, I did not want to get sucked into this trap and have my mentality slowly twisted into reasoning out why it was okay to be unethical and environmentally detrimental for a little while (just till you gain success, or just till you get on your feet, etc, etc). I wanted more…I wanted to reduce waste by making use of what already existed and I wanted to make clothing that was unique to the individual, not mass produced. I thought that not being able to combine all these things together was ridiculous, and set out to unite them in Error Guided Designs. I really just wanted to have my cake and eat it too, and now I get to do just that. The name Error Guided Designs comes from a combination of things. Originally I just wanted my own errors (in university and life) to be seen as the unexpected art pieces I felt they were. I believe that my mistakes guide me to come up with unexpected, wonderfully creative, innovative ideas, that otherwise would not have existed. However when I saw the amount of waste being created by what the fashion world regarded as “errors or mistakes” I started to comprehend that the real error was coming from the fact that the fashion industry (for the most part) still does not see the need to be ethical and/or sustainable. Now the name Error Guided Designs has taken on a much more important meaning. It now stands for the possibility of letting what is considered a “mistake or error” guide us to creating new truly unique items. To re-imagine, re-configure, reuse, interpret, and to see the beauty in our “mistakes/ errors” and to capture that and express it outwardly. If we are ashamed to admit our blunders, we do not have the chance to learn or make up for them because we are so busy trying to pretend we did not make them to start with. We all make mistakes and I think it is time not just to make up for them but show them off and hold ourselves accountable for them. For me Error Guided Designs means, learning from your mistakes and not only making the most of them but using them to your advantage. Q. Can you tell us a little about what makes your label both ethical and eco-friendly? I have three core values infused into Error Guided Designs that ensure every garment is both ethical and sustainable, as well as making sure that the clothing is empowering to the wearer. 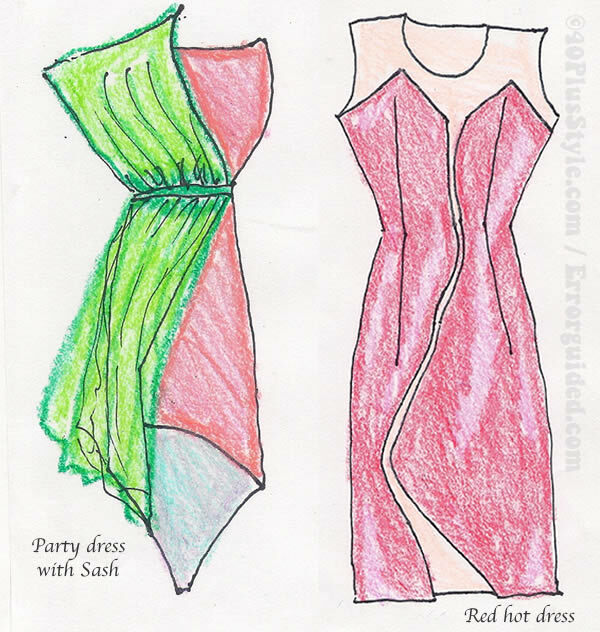 The couture aspect of Error Guided Designs means I make each sketch for a specific individual using as much in-depth (at times very personal) information gathered through e-mails and my online questionnaire, http://errorguided.com/q/ as possible. Then for a small fee I grant that specific individual the right to produce my design as long as they agree to all three core values being used in the process. The personalisation aspect is an incredibly important part of Error Guided Designs for me, because it empowers the customer to feel validated about themselves as the clothing is designed in a way that’s almost a tattoo level extension of their being and fits their unique body measurements exactly. Q. Which ethical designers are inspiring you right now? I am not sure that there is a particular designer that inspires me, I get my inspiration from all kinds of people, places and things. If I had to choose one it would probably be Rachel Freire, her aesthetic and mine are quite opposite, but her designs are unique and her use of materials is innovative. I am also inspired by organisations like Redress in China, Models of Diversity in the UK, the Ben Barry Agency in Canada, Bethann Hardison, and so many others that are making strides to bettering the world. Q. 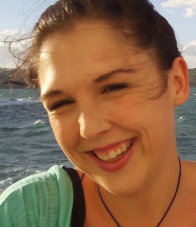 What is your involvement with Malta Women in Business? 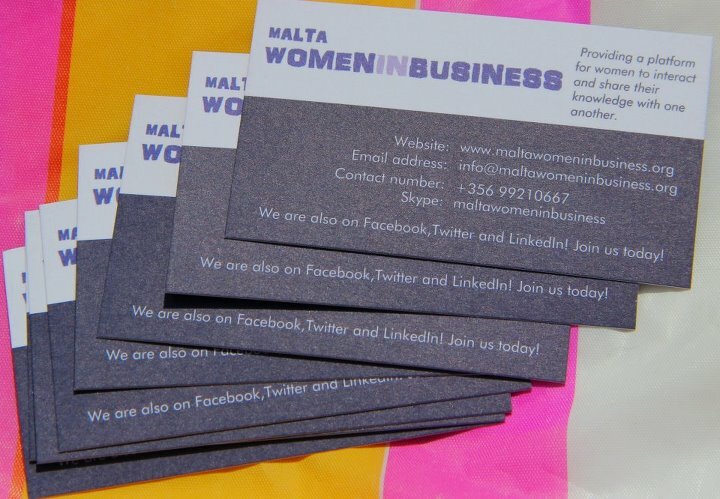 I became a member of Malta Women in Business so as to be a part of my current local network of women who are making an effort to succeed in there respective businesses. I wanted to be part of a like-minded community here in Malta and felt that partnering with Malta Women in Business would be the best way to achieve this. I think that it is very important to stick together and support one another, that is why I look to partner with local businesses; especially if the are run by women, seeing as women face many more challenges than men in business. Wherever I may be doing business (myself or for a customer far away), I will look to build mutually beneficial connections. The importance of forming alliances and supporting other business women is a big part of Error Guided Designs, that is why I have set up a promotion where for every fifth suit or evening gown sold, I will make a free business outfit for one promising female entrepreneur at a time. Q. In your opinion what is the major challenge facing designers who want to be more sustainable? I think the major challenge is money. Designers who want to be sustainable need money and customers to get started and stay in business. With fashion being produced mass market, at incredibly low cost and sold worldwide, it is hard to compete. Especially with the current economic situation. Even if there are a lot of people that want to be more ethical and environmental with their purchases, they cannot always afford to do so. There is an expectation when buying clothing, to see previously made garments before choosing a garment for one’s self. I want to move away from this model and not influence or prescribe my (or a prior client’s) personal style/taste/aesthetic/beliefs on new clients. That’s why I offer people free sketches, so they can see if I can capture their essence in my designs before production starts (reducing any possibility of misinterpretation or waste). Working with me is a collaborative process and an invitation for customers to embrace an opportunity to co-create. Since the process is so individual and changes from situation to situation (depending on location, resources and possibilities) I no longer list set prices on my website. Having a quote-based system challenges fast consumerism and I emphasise that it costs nothing to be curious, as the initial sketches for private audition viewing are free. You don’t pay anything until we get into an agreement on how to work together and how my designs will be used. Until the majority of society expects sustainable fashion to be the norm…we as designers have to be active and engaging educators and co-collaborators in this plight and I’m hoping the couture aspect of what I do really draws people into this on a level that’s truly personal to them. Speaking about things on a personal level, I also have my own challenge to being a new ethical designer. I have been battling minor learning disabilities throughout my life that make writing, math, pattern making etc. very time consuming, difficult and frustrating to undertake, especially in a world where few have the patience to work with someone with a disability. Assistive technology isn’t always accessible because of cost so I have been very fortunate to have had the support and help of my family and friends in facing and trying to overcome these challenges. Q. Do you have a favourite item that you’ve created? 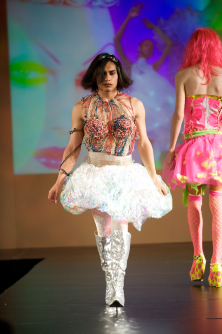 My personal favorite so far, would have to be the “Technology” outfit I created for my senior fashion show at Woodbury University. 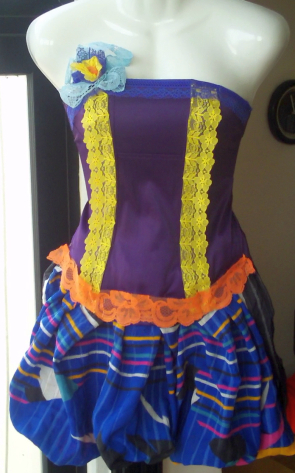 It was made using old electrical wire (the top) and upcycled cellophane wrap, the kind used for gifts and flower arrangements (for the skirt). I have an item that I think will surpass this one and become my new favorite, if I ever get the chance to make it. The design I have in mind is intended for Lady Gaga, but seeing as I have no way of showing her the design or getting it to her (nor do I have her measurements or approval) I have not made it yet. Q. What does the future hold for Error Guided Designs? I will soon be taking myself and Error Guided Designs to Germany (most likely Berlin area) in August. I intend on still being an international web-based company, but hopefully with a base/studio while in Germany, so that potential clients there can come directly to me and it can be a truly interactive experience. You can find Error Guided Designs on Facebook, Twitter, Pinterest and Indiegogo.